2. Checking electric insulation resistance. 6. Defining valid conversion coefficient. 7. Defining relative transverse conversion coefficient. 8. Defining bandpass flatness (АFR). 9. Defining amplitude nonlinearity (АR). 10. Defining setup resonance frequency. 11. Defining transverse resonance frequency. 5. Two voltmeters for registration of vibration sensors indications. When choosing the equipment, take into account that reference vibration converter, coordinating amplifiers, voltmeters and generator must be registered in the measuring instruments register. 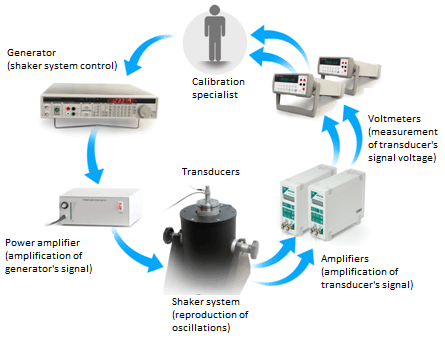 Reference vibration transducers and vibration transducers for verification are installed on the vibration table and connected to electronic voltmeters directly or through an amplifier. A sinusoidal signal generator is used for vibration board control and connected to the vibration board through a power amplifier. — increase of generator voltage if vibration acceleration amplitude is below the required level, reduction if vibration acceleration amplitude exceeds the required level. 3. Recording the voltmeter indications. During measurements in the frequency range, constant vibration acceleration amplitude at different frequencies is reproduced. During measurements in the amplitude range, constant frequency with different values of vibration acceleration amplitude is reproduced. Time-consuming results processing is required after all necessary measurements. Thus, verification of a single vibration transducer may take 2 to 3 hours. An automated vibration sensor calibration system designed by our company reduces verification time to several minutes!